Can stealing from your neighbor be a mutualism? Imagine that your neighbor sometimes goes into your house and takes some food out of your fridge. Sometimes you catch her, but you don’t get violent about it, you just push her out and tell her to not come back. But she keeps sneaking in. This entry was tagged animal behavior, ant science, mutualism, thievery. Science can be creative and elegant. To illustrate this fact, I want to bring to your attention a groundbreaking review paper that was recently published in Myrmecological News, written by Michele Lanan of the University of Arizona. Usually the terms “groundbreaking” and “review paper” aren’t paired with one another. Review papers usually codify existing ideas, propose some new ones that may fall flat. And, if you chat with an editor, you’ll learn that good reviews really improve a journal’s impact factor. Then there’s this amazing review I loved so much I had to write this post about it. Even if you don’t know a thing about ants, I’m betting you’ll love how the paper draws a clear and simple explanation from complex interacting phenomena. Ant people are asked about foraging behavior quite often. How and why do ants make trails? Why do some species make trails and others don’t? Until now, our answers were vaguely correct but relied heavily on generalizations. Now, after Michele Lanan scoured pretty much every paper that’s ever collected data on foraging behavior and ecology, we have a quantitative and robust explanation that is powerfully simple and elegant. We’ve known that foraging behaviors are structured by that ways in which food is available. Among all ants, there’s a huge variety of foraging patterns. Some are opportunistic hunter-gatherers, others are nomadic raiders, and some use trunk trails, as in the figure below. These patterns reflect differences in food availability. Figure from M. Lanan 2014, Myrm News 20:50-73. How, exactly, is it that the properties of food availability can predict how ants forage? In an analytically robust and predictable manner, that works for all ants throughout the phylogeny? It doesn’t require an n-dimensional hyperspace to understand foraging patterns of ants. It only needs a 4-dimensional space. Lanan took into account four properties of food items: size, spatial distribution, frequency of occurrence, and depletability. She arranged these variables along four axes (as on the right), and showed how this this 4-dimenstional space foraging patterns in the figure above. How do these foraging patterns distribute across the major ant subfamilies? Are some lineages more variable than others, and what might account for these differences? 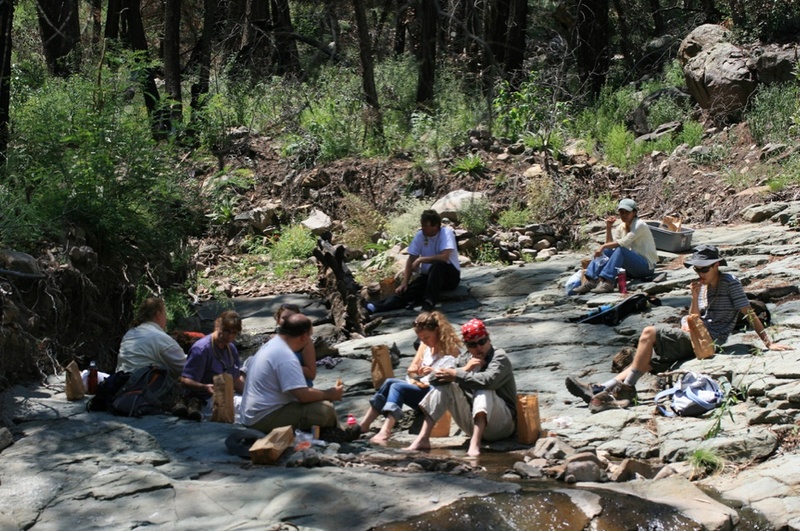 What other beautiful figures and photographs are in the review that illustrate the relationship between spatiovariability of food and foraging biology? As they say on Reading Rainbow, you’ll have to read the review to find out! Reference: Lanan, M. 2014. Spatiotemporal resource distribution and foraging strategies of ants (Hymenoptera: Formicidae). Myrmecological News 20: 50-73. As a disclaimer, I should mention that the author of this paper is a collaborator and friend of mine. And she is leading The Ants of the Southwest short course this summer which I’m also teaching — and spaces are still available! But that’s not why I’m featuring this paper. I am enthusiastic about this paper because it so obviously resulted from a labor of love for the ants, and is a culmination of years of reflection. This is just a downright gorgeous piece of science, and the more people that see it — and the more recognition that the author gets — the better. Today is Taxonomist Appreciation Day! Many fields of science are important, and many fields of science are appreciated. The field with the greatest importance : appreciation ratio is taxonomy. Taxonomy is critical for almost everything we do in biology, but few demonstrate appreciation for the hard work and expertise that is required for useful taxonomy to happen. Let’s change that! We are deep in a taxonomic crisis. Our own species created the planet’s sixth major extinction event and we are lacking the expertise to understand what we are rapidly losing. Taxonomic work is the foundation for understanding how to save what we can and make plans for the future. Any fix to the taxonomic crisis requires a recognition of the essential nature of the work of taxonomists and systematists, and the value of museum collections and those who use them to explain our world. We must show taxonomists how much they’re worth to us. We need to back this up with the necessary resources, of course, but we all need to be showing them a lotta love too. I’d like to write a bit about the taxonomist that’s made my work possible. As an ecologist, most of what I do is only possible because because of the unfathomably detailed and dedicated work of one systematist and all-around-great guy, Jack Longino. I don’t even know where to begin with the awesomeness of Jack, and of what he’s done. En route to a bevy of discoveries in evolution and ecology, he’s provided a comprehensive picture of ant biology throughout Costa Rica, as well as Mesoamerica and beyond. Of course there’s always more work to do, and a lot of that is only possible because of the foundation of his natural history and systematic work. Jack Longino worked on the ants of La Selva Biological Station under the umbrella of the ambitious Alas Project: The Arthropods of La Selva, While heading up (in part) this huge project funded by a series of four NSF grants, he focused on ants. In the process, he made the most comprehensive and easy-to-use guide to identifying ants to species for anywhere in the tropics, perhaps the world. In fact, it is easier for me to train a student to identify an ant in the rainforest of Costa Rica than in my home in California, because the tools that Jack created are just so perfect to get ants to species. And when you get to a species page, you get detailed natural history notes of the biology of the species, including the rare ones. (For great examples, check out his notes on Gnamptogenys banski and one of my favorite critters, the gypsy ant Aphaenogaster araneoides.) In recent years, he’s ported over to the globally comprehensive site Antweb, and expanded his range throughout Mesoamerica and northern South America. Which is much cause for rejoicing among myrmecologists in these areas. And NPR, too. And, a spectacular part of all this is that he did this while serving on the faculty of The Evergreen State College. I’ve seen him in the field with students on several occasions, and he’s a thoughtful, attentive, realistic and enterprising mentor. (He’s recently moved to the University of Utah.) And whenever I have questions for him, he’s prompt, detailed and doesn’t even seem to mind. I don’t know how to make a taxonomy pun out of this, but he’s 100% class. Acknowledgments: This year’s pun contest by BuzzHootRoar generated some great art and new attention to the importance of taxonomy for ALL of us scientists. I came up with the idea for Taxonomist Appreciation Day on a half-whim last year, but I’m serious about it. It’s an idea whose time has come. And I am so thankful for the people who’ve helped picked up the idea and shared it, including BuzzHootRoar, the NSF Division of Environmental Biology, and Alex Wild, and hopefully many more of you today. (If you’re a twitter person, #loveyourtaxonomist is the not-so-secret handshake.) The Smithsonian Department of Invert Zoology came up with an aptly timed post (beware: contains comic sans). Next year, let’s have a bigger and better Taxonomist Appreciation Day! I’m open to all kinds of ideas, in addition to the great ones of DEBrief. This entry was tagged ant science, biodiversity, evolution, holiday, systematics, taxonomist appreciation day, taxonomy, undergraduate research. Here’s a specific example, from my own work, of how the avoidance of mathematical modeling led to a fundamental discovery that eluded modelers and experimentalist for decades. At least, that’s how I see it when I’m not feeling humble. It’s about resource allocation in ants, not the grand unified theory, after all. For context, for those newer to the site, consider this post as a coda to an ongoing series (and discussion of sorts with Dynamic Ecology) about approaches to designing a research program. I have advocated that exploration by tinkering with unexplained curiosities within natural systems often leads to the best discoveries as well as the most consequential research programs. This post from a few weeks ago provides a good summary of that series. Another precursor to this post is a discussion about the relationship between mathematical modeling, hypothesis development, and how much math you need to become a scientist. That is also a precursor to this post, though it is a “long read,” for those averse to verbiage. The subject of this post — the scientific discovery — came out in a paper last year (go read it if you wish), which I wrote with Sarah Diamond and Rob Dunn. In short, we discovered a fundamental pattern that could have been obvious to everyone, if anybody just looked in that direction. This pattern explains many unanswered ideas, going back to theories that E.O Wilson developed in the 1970s, along with George Oster. A twig nest of Pheidole sensitiva. Oster & Wilson set out to understand what regulates the varying levels of investment into the different members of ant colonies. Most inhabitants of ant colonies are functionally sterile, and in some species, there are multiple physical castes of sterile ants. The genus Pheidole is the most species rich ant genus, and they’re found pretty much everywhere. All Pheidole (aside from a few exceptions) do something that isn’t found in many other lineages: they have two discrete sterile worker casts. They make big-headed soldiers and tinier minor workers, both of which do a variety of work for the colony. 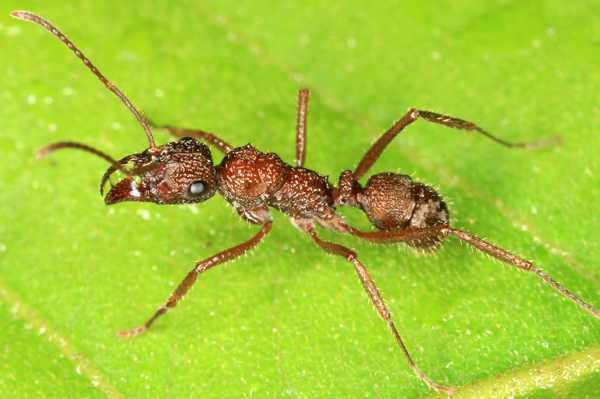 Some think that this dimorphic worker caste, and potentially the flexibility tied to its production, has enabled these ants to not only become ecologically successful but also to diversify. Anyhow, Oster & Wilson made a number of predictions about the adapability of the ratio of soldiers to minor workers in Phediole colonies. One of their big testable predictions, or perhaps it could be seen as model to be falsified, is that the colonies actively adjust the ratio of soldiers to workers in response to environmental challenges. It entirely makes sense. If a Pheidole colony is in an environment that requires more soliders, they would make more soldiers. Right? The problem is, despite a lot of looking carefully at Pheidole colonies, this wasn’t found. Finally in the mid ’90s it was found in the lab of Luc Passera, that P. pallidula colonies made more soldiers when they were exposed, without contact, to neighboring colonies. When I say it was found in the lab of Passera, I mean it happened physically in his lab. These were captive colonies. A similar thing was found in the field in 2002, when I and Jeb Owen published a paper showing adaptive soldier production in another Pheidole species. (Also, my labmate Samantha Messier did the same thing before the Passera group, in a field experiment involving Nasutitermes termites and a machete.) Our studies were done in the field. In my experiment, when I put clumps of supplemental food in the field for months on end, the food was defended by soldiers, and in a short time colonies made more soldiers. One thing I didn’t mention at the time, though, was that I didn’t find adaptive soldier production in a whole bunch of other species. However, I had less statistical power, and it was the most common species that showed this pattern. Maybe the less common ones did, but it was harder to detect. If you were to ask around and dig into the literature, you’d see that it’s pretty clear that most species of Pheidole actually do not overtly shift their caste ratios when you mess around with their environment. Not every colony produces the same ratio, but a systemic environmental manipulation doesn’t cause an increase. Other than the two papers I just mentioned, I don’t think anybody else has found adaptive caste ratios in Pheidole. Others have looked, but it hasn’t emerged very clearly. So, if most species just don’t ramp up and ramp down soldier production in response to the environment, what controls soldier production? For decades, there has been a consistent amount of work asking this question from behavioral, physiological and developmental angles. In the course of all of this excellent work (a lot of it being done by Diana Wheeler, Fred Nijhout, and their associates), we’ve made a lot of progress in understanding how colonies regulate their activity and how development is regulated through genetic, biochemical and physiological mechanisms. One thing that I’ve always wondered about is, why do some species produce more soldiers than others? I’ve cracked open lots of twigs, and the numbers of soldiers are highly variable. And my experiments have shown that most species don’t obviously change their soldier production in response to environmental changes. There has been lots of great work to understand variation within a single species, but interspecific comparisons have been scant. I can understand why there hasn’t been much comparative work. Measuring caste ratios of entire colonies can be hard. Find a Pheidole colony in the back yard and compare the number of soldiers and workers. See, not easy, huh? You’ve got to dig them up. Unless, of course, your backyard is a rainforest. In that case, you just pick up twigs. Over the years, I estimate that I and my students have picked up over 106 twigs over the years. Thousands of these have had Pheidole colonies inside. The rainforest is diverse, so I have data on many species. How do they compare? Well, I learned that the caste ratios were different among species. Some species produced way more soldiers than others. Considering that we know so little about the natural history of these species, there wasn’t a great basis for comparing many of these species to one another. But one thing we could examine, quite easily, was body size. And, as it turned out, that was super-duper predictive of solider investment. Smaller species produced more soldiers than larger ones. When this pattern emerged on my laptop, it was one of those moments of elation that are very cool, but then you don’t have anybody with whom to share. Then, I dug through the literature so see if the information that we had about caste ratios and body size shows the same pattern that I found in my rainforest. It turns out that the relationship is as identical as you can get. Our local scale pattern recapitulated Pheidole from around the world, and across the phylogeny. Now, if you ask someone, what controls soldier production in Pheidole? You can say the answer is quite clearly body size. How and why does body size control this? There is some cool work that’s been done on this intraspecifically, that presumably is a mechanism that works more broadly. How did my discovery of this generalized relationship come about from avoiding models? If you look at the work on soldier production, ever since Oster & Wilson published their monograph in the 1970s, there’s been a strong emphasis on modeling the mechanisms that trigger and regulate soldier production. Meanwhile, nobody before me bothered to step back to look at the big picture and ask, “how are species different and what is predictive of that?” If they did, then they would have found the caste ratio data in the literature as I had, and looked at the most obvious predictor: body size. Others were modeling solider production. I was merely trying to find a pattern. I’m not claiming that the discovery of this pattern is earthshaking or that it explains mechanistically how colonies make more or fewer soldiers at the proximate level. The main take-home message from this paper is that many of the differences we find are driven by constraints rather than by adaptation, or that selection on body size is coupled with selection on soldier production. This leads to a lot of exciting thoughts about community structure, which we’re now working on. This work by no means diminishes all of the careful experiments that others have done over the years on Pheidole. Though I’m not a developmental biologist nor as much of a behaviorist, I was able to find something that will be (or at least, I think should be) at the basis of future conversations about the evolution of caste ants. This is why my choice is to keep asking “What is the pattern?” rather than attempting to model patterns. This entry was tagged ant science, research strategies, tinkering. This is the fourth and final post in a series, wherein I attempt to make the case that tinkering is a viable, and perhaps optimal, approach to conducting a research program, particularly for those at teaching-centered institutions. Here are the first, second, and third posts preceding the present post. I’m a tinkerer. That means that I don’t typically design my research to fit the framework of a big theory, but instead I set out to answer a small little question that has occurred to me. I do experimental research, combined with observational research, to find the answers to open questions. I’m just not going after the big fish that other labs do. After all, I work in a small pond. This is a personal narrative about how tinkering has worked for me. It’s hard to write about the concept in the abstract, so I’m going into the specifics about one line of tinkering I’ve done over the years. If I am going to make the case that tinkering works well for me, it’s easiest for me to to use specific projects to illustrate how tinkering has worked for me. So if you read on, you’ll be reading about ants. Consider yourself forewarned. When I started as full-time faculty at a teaching institution, I found myself with the position of having a field season in front of me. What did I want to do? My dissertation was one part of getting the invasive ant bandwagon rolling, but after taking a job at a teaching institution, I needed to find a better ride. I had a few papers that made a difference, by looking at the issue from a broader-than-usual perspective, and it was time to move on. I knew that I wanted to get back to my field station in Costa Rica. It was a place that I knew well from my dissertation, and it had become kind of a second home to me, and I hadn’t been down there for 18 months. 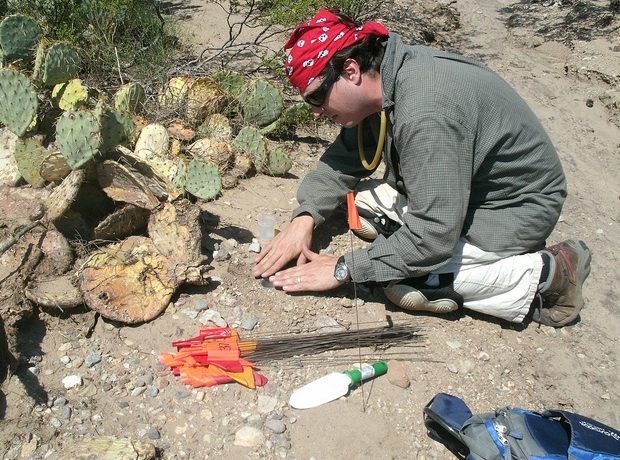 I had a few weeks on site, along with several undergraduate field assistants. My main goal was to ask, “What is up with this extremely common species that we know nothing about?” I built it around a question about unpredictable resource heterogeneity, competition, and whatnot, but it was mostly a vehicle to play around, because I knew nothing about this species. And I wasn’t going to go down for a few weeks and not get a paper out of it. Even though I designed that cute little project to be fail-proof (negative results would still be publishable), I barely eeked that paper out. That was because my sample size was dropping precipitously throughout the short experiment. We started out by marking a bunch of colonies in the field. As days progressed, the colonies flat out disappeared. Their nests were just empty holes. By the end of our experiment, we sorted out that they just moved nextdoor. Over the course of a few weeks, we’d lost well more than half of our colonies, but I didn’t have data on them after they moved. The next field season — one year later, after my first year on the tenure track — I had a few more weeks with a team of undergrads. I wanted to understand the non-optimality of home range size. I was ready for nest movements, and built it into the experimental design. The answer was kind of interesting: foragers spent more time looking for food before giving up when the home range is of poor quality. At this point, for two years on the tenure-track teaching a full courseload of new courses, I’ve gotten two okay papers out from two short field projects, while spending time on other projects as well. At the rate of a paper a year, I would’ve been well exceeding scholarly expectations at my university, as a decent first-authored paper per year is pretty good at a teaching institution with a heavy teaching load. I was okay with my publication rate, but I felt like I wasn’t taking this anywhere interesting. I felt that I knew this critter pretty well. The most curious thing was nest movement behavior. Delving into the literature on nest movements in ants, I found that nest movements have been documented aplenty. But in each species, it was studied only once. It looked like everyone experienced what I did – they stumbled on the phenomenon which botched an experiment, and then they wrote up how the experiment was botched by nest movements. Then, they moved onto more tractable systems, using animals that don’t disappear when you’re not looking. Nobody had gotten far beyond the nest-movements-botched-my-study study. I decided to directly tackle nest movements in my next field season, which was, again, with several undergrads for about a month. All I wanted to know was, “why do they move their nests all the time?” You can’t ask “why” questions with science, though, so I asked “how” and “with what consequences, correlates and a potential cause.” These results were really interesting to me. It turns out that they move, on average, about once per week, and it has nothing to do with food or competition. After working on a variety of other things, I wanted to take some time to get back to these mysterious nest-moving ants. My earlier work suggested – only vaguely – that odors might play a role in how they move their nests. I wanted to see if this was the case. So, I ran an experiment by experimentally manipulating nest odors. It turns out that nest odors can keep them from occupying or staying in nests, but the manipulation had enough artifacts I can’t really trust that this experiment explained what was really happening. While working on other stuff, this nest odor problem kept nagging at me. Eventually, while I had students doing a variety of other things, I cooked up a field manipulation for myself to run, by reducing odors within the nest. That made them like their nests more than they would otherwise. But then, again, what does this really show? If their endogenous odors make them dislike their nests, what’s the selective pressure behind nest movement? That’s a really hard question to address. How were those experiments tinkering? Well, one thing you may or may not have noticed is that the only reason I did these experiments was to figure out what’s going on with these ants. I was curious about what they were doing, and so I tried to sort it out. I didn’t come in to working with this system with a big question about optimal foraging, neighborhood competition, or social organization in mind. I just wanted to know exactly what this one species was doing, because it was a mystery to me. Because I was open to this species to telling me what it wanted to, I let it take me in the direction where I was led. You’re moving your nests all the time? Sure, I’ll try to figure that out. I wasn’t setting out to use nest relocation to evaluate any grand theory about social insect behavior or movement theory in ecology. I just wanted to know about what was causing them to move their nests. In the process, I documented in some detail how they maintain multiple unoccupied nests, but only use one at a time. This was seen in a few other species, but it was a distinct and heretofore undescribed pattern of nesting. I thought to give it a new name — “serial monodomy” — which might stick. What else do you do when you find something that happens that doesn’t have a name? This project has gotten me to think more about nest relocation in ants. It’s permeated a lot of my thinking about the biology of this community of ants, and has seeped over into my community-level work. I realized that nest relocation is biologically significant, and is not taken into account in so many studies. And we pick our study systems by focusing on the tractable species: those that don’t move. Looking at what is known, I found that most species are apparently mobile, and those are the ones that we don’t study for this reason. Our whole understanding about ants is very biased. I decided to write a review about that idea. Ultimately, I think my work on nest movements on ants has had some influence on how our research community thinks about ant ecology. At least there’s been some movement (yes, that’s a pun) in that direction. Not too long ago, the prevailing notion was that typical ant colonies are like plants, that just don’t move. There are some oddballs, like invasive species and army ants, that move around, but everyone else is anchored down. I’m pointing out to others that this notion is false. I’ve only done work addressing nest relocation with this one species, but in the process I’ve called attention to all of those other species that have been found to do similar things but are overlooked. Of course, anybody who really knows ants easily realizes that nest relocation happens in a bunch of species. But this fact hasn’t been broadly appreciated, nor had it been documented. By working on this phenomenon, in detail, within one species, I was given the perspective that allowed me to make this concept more tangible across the phylogeny. If you asked me after I finished my dissertation, what are you going to work on? I never would have said, “nest relocation.” I wouldn’t have identified any major concept or theory. I mostly was focused on teaching, after all. I wanted to do some cool projects when I had the chance. This brought me to working with a very common ant, which compelled me to figure out its nest movements because that’s a basic part of its biology. I was just tinkering around with it to figure it out, that’s all. But following that direction, once in a while over the years, I’ve built together a set of substantial ideas, that I imagine will continue to matter for some time to come. 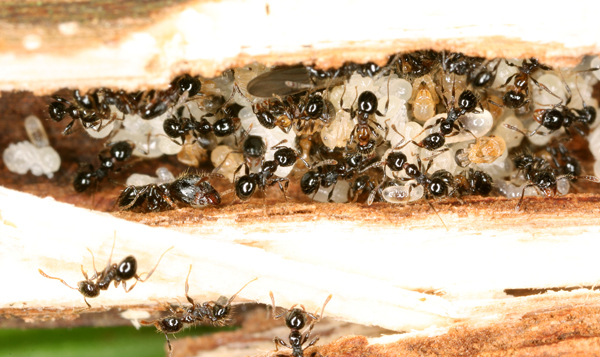 This work on nest relocation on ants isn’t earth-shattering. But it is changing, just a little bit, how we think about ants, including changing some long-held and mistaken assumptions. This is just the result of five trips to the rainforest for 2.5-5 weeks each, over the last 13 years. That’s not too bad. I think if I went down to the rainforest trying to test a big theory, I would have come back empty handed, or with a few papers that mostly would be collecting dust by now. But simply by wandering off without a specific vision of big theories, I think I’ve done something that results in tangible, if not big, progress. So, that’s my case for why tinkering is a good way to do science. You might stumble on something amazing, or you might come upon something just mildly curious, but no matter what happens, you’ll learn something genuinely new. Just imagine what else we’d be learning if other scientists doing basic research, in all kinds of disciplines, started doing research in obscure directions on things that were mysterious to them but didn’t seem of much obvious consequence. I think we’d be learning a lot more about the world and probably develop many new ideas more quickly than we are now. This entry was tagged ant science, nest relocation, theoretical bandwagons, tinkering.